Embark on an unforgettable journey aboard the Venice Simplon-Orient-Express between some of Europe’s greatest cities on this fabulous tour. Travel on the Eurostar from London to Paris and be astounded by the glamour of the City of Light. Enjoy a private transfer to the Hotel San Regis and settle in for a two-night stay in Paris. Alternatively, choose from one of our other luxurious hotel options. Explore the city on a half-day tour. You’ll start at the tree-lined Champs-Elysées, with its ceremonial Arc de Triomphe, and continue to the Palais de Chaillot. Enjoy the views of the Eiffel Tower across the Seine and visit the École Militaire and Les Invalides, where Napoleon is buried, followed by the historical Place de la Concorde. The tour concludes in the east end of the city with a visit to the Île de la Cité, the Conciergerie, the Hotel de Ville and Pont Neuf. Transfer to Gare de l’Est and board the supremely elegant Venice Simplon-Orient-Express train. After being greeted by your steward, settle into your cabin and relax with a delightful afternoon tea. Later, enjoy a delicious gourmet dinner on board. Continental breakfast is served in your cabin as you travel into Hungary. Lunch will be taken in one of the opulent dining cars. On arrival in Budapest, you’ll transfer to the Gresham Four Seasons for your overnight stay. After breakfast at the hotel, enjoy a private guided tour of Budapest, with lunch at a local restaurant included. Rejoin the train in the late afternoon and perhaps enjoy an aperitif in the Bar Car before dinner as the train travels into Romania. Today the train arrives at the mountain town of Sinaia. After breakfast, disembark for a visit to beautiful Peleș Castle. Rejoin the train to complete the short journey to Bucharest. On arrival, transfer to the JW Marriott hotel. In the afternoon there will be a short sightseeing tour. You’ll enjoy dinner and an overnight stay in Bucharest. This morning, rejoin the Venice Simplon-Orient-Express train as the train travels south across the Danube and into Bulgaria. During the afternoon, a stop is made to enjoy this pretty, rural country. Enjoy your last evening aboard as the train travels to your destination, Istanbul. After breakfast and lunch on board, the Venice Simplon-Orient-Express train arrives in Istanbul. Enjoy a private transfer to the luxurious Four Seasons Sultanahmet for a three-night stay. Alternative hotel options are also available. Join fellow travellers on a full-day tour of this fascinating city, including the Blue Mosque, Hagia Sophia, the Topkapi Palace and the Grand Bazaar. Lunch will be provided at a local restaurant. Explore the city that straddles two continents at your leisure. Day at leisure, or allow us to arrange additional excursions for you. Departure and transfer to your next adventure. Rekindle the romance of the rails as you travel between Europe’s most captivating cities. 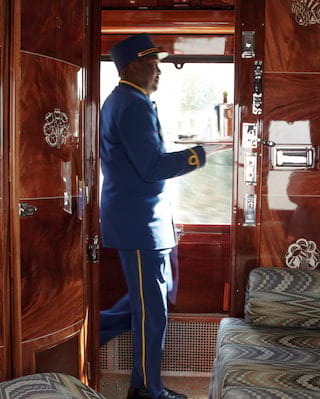 The Venice Simplon-Orient Express is the most storied set of carriages in the world. It promises to take you not just across Europe, but to transport you back in time. With its polished wood, sumptuous upholstery and antique fixtures, the train epitomises the glamour and elegance of the Golden Age of travel.